COSME builds on the success of CIP, the EU Competitiveness and Innovation Framework Programme. Among the most important achievements of the CIP figures the effectiveness of the action on the access to finance through the Entrepreneurship and Innovation Programme (EIP). With a budget of €1.1 billion for financial instruments, the EIP has helped to mobilise €20 billion of loans and €3 billion of venture capital for SMEs across Europe. The Enterprise Europe Network (EEN) is the main instrument of COSME to achieve its aim to improve SMEs’ access to markets and support their internationalisation. EEN was launched in February 2008 with the objectives to help businesses innovate and grow on an international scale. It is active in more than 60 countries worldwide, making it the largest global support network for SMEs with international ambitions. It brings together 3,000 experts from more than 600 member organisations – all renowned for their excellence in business support. EEN contributes to the growth of EU SMEs in terms of turnover and employment. It supports the SMEs by providing integrated services like access to information, especially about EU funding and internal markets. Furthermore, the Network gives essential information for SME internationalisation beyond EU market. Access to new markets and development of new products are among the main benefits acknowledged by the SMEs which have used EEN's services. 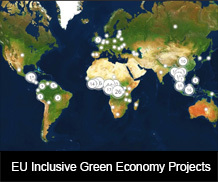 The COSME Programme has an important international dimension depicted by the geographical scope of the EEN. The network is active in about 40 countries beyond the EU, located in Asia, Africa, and North and Latin America. The network’s global presence benefits the SMEs wishing to expand their businesses and be in contact with business partners in countries outside the EU. A Eurobarometer survey (2015) displays that about 50% of SMEs in the EU were involved in international business beyond the Internal Market over the last 3 years. Synergies are crucial between components promoting access to finance, access to markets, enabling framework conditions for competitiveness and entrepreneurship, in order to enhance impact and ensure that the main bottlenecks to SMEs’ growth are addressed. Working with business intermediaries is an effective approach to benefitting SMEs as end-users of support. Enhancing awareness of the Programme’s instruments among organisations representing business, for instance, might assist the involvement of a wider group of beneficiaries. Despite numerous efforts to improve the availability of financing systems for the SMEs, access to finance remains among the largest problems faced by individual SMEs. The more support services used by the SMEs, the higher is their growth in terms of increase in turnover and employment. There is sufficient scope for EEN to cover all countries benefitting from EU support to private sector development. The synergies of the EEN with the Cluster Internationalisation Initiative are important in permitting cluster-to-cluster and cluster-to-business meetings. Such meetings may create economies of scale and bring additional opportunities for individual SMEs participating in the events. The organic supermarket: It is one of the 378 000 SMEs that benefitted from the CIP. The enterprise was launched in 2008 in Ireland with the aim to provide customers with organic products. Darren Grant, the manager applied for the European Investment Fund through Irish microfinance institution and received 25 000 euros without which he wouldn't have been able to start his business. In 2017, The Organic Supermarket has 3 branches in Dublin and a website covering the nation of Ireland. They are planning to expand the company to other countries. Fortumo: An Estonian mobile payments SME, has become a success story that illustrates the efficiency of the Enterprise Europe Network. The company contacted EEN asking for support in expanding their activities beyond Estonia. Fortumo were invited to a brokerage fair organised by a Spanish Network partner at the 2010 World Mobile Congress in Madrid, where they met NVIA Portugal, another Network client, with whom they agreed to cooperate, to break into Latin America. Soon after, Intel Capital in cooperation with US risk capitalists Greycroft Partners, bought part of Fortumo shares, making a deal at a value of about 10 million euros. Thanks to EEN, Fortumo have made exponential growth and expanded geographically. By 2017, Fortumo was present in more than 90 countries across Europe, North America and Asia. This publication has been produced with the assistance of the European Union. The contents of this publication are the sole responsibility of the consortium implementing the SWITCH to Green facility (led by sequa gGmbH with GFA Consulting and Pracsis) and can in no way be taken to reflect the views of the European Union.